Richard Posner and Eliot Spitzer: Why corporate governance is broken. I had a fascinating conversation today with Judge Richard Posner of the 7th Circuit. 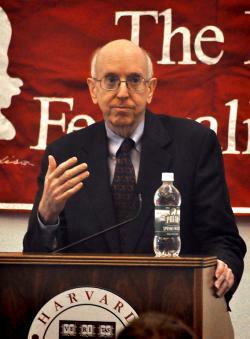 Posner, a Slate contributor, is one of the most prolific writers and thinkers on the federal bench, and one of the originators of the influential Chicago “law and economics” school of thought. This makes his thoughts on the financial crisis and its aftermath, and on originalism as a mode of constitutional analysis so fascinating. One area we delved into—the interview will air on my show on Current TV—was corporate governance. We agreed that corporate governance right now is broken, and it is hard to see a remedy. CEOs have arrogated the rights of shareholders. Boards, supposedly the check on CEOs, are usually just rubber stamps for the CEO. There are significant problems in activating shareholders. Exit, Voice, and Loyalty by Albert Hirschman has brilliantly delved into why shareholders have such a hard time getting involved. There have been brief moments of shareholder activism that suggest hope—but precious few. Whether these sparks can be fanned into something more remains to be seen.